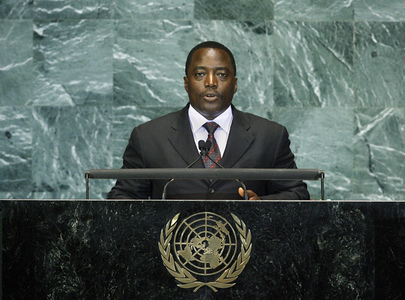 JOSEPH KABILA KABANGE, President of the Democratic Republic of the Congo, said humanity faced several crises which were made worse by the self-interest of nations. The adoption last night of the declaration on achieving the Millennium Goals was a message of hope, but it also highlighted a gap which separated wealthy countries from the poor. The food crisis and famine afflicted many people, and diseases that had once disappeared were now resurfacing. Moreover, a plethora of natural disasters had occurred in the wake of climate change. That grim reality should motivate the world to become more unified. The international community must mobilize efforts in a spirit of constructive solidarity to find solutions commensurate with challenges. To that end, he appealed to all States to tirelessly undertake efforts to bring about peace in remaining areas of tension. The Democratic Republic of the Congo faced multifaceted crises, further worsened by previous wars. It also suffered from the negative consequences from the global economic and financial crisis. Poverty, misery and the country’s precarious situation were neither inevitable nor revocable, he noted. He wanted to see a brighter and more promising future for his country, and he stressed that his country would surely make its contribution towards a better world. Turning to the issue of environmental preservation, he reaffirmed the Congolese Government’s commitment to defend biodiversity in its policies and national development plan. He also highlighted the need to establish a global environment authority in cooperation with both public and private institutions, civil society and scientific circles. With regard to establishing and consolidating peace, he welcomed the Secretary-General’s decision to consider establishing a United Nations office for Central Africa. Such an office would help to bring the Organization closer to and ensure better coordination with the countries of the region. Issues of peace, security and humanitarian efforts could also be considered much more promptly. It was up to world leaders to consolidate peace throughout the region via international and regional mechanisms for maintenance, prevention and the settlement of conflict. The Congolese Government had recently focused its efforts to eradicate the phenomenon of foreign arms groups in its national territories. Its actions related to the Lord’s Resistance Army (LRA) were a matter of defence, as well as public order. In light of the crimes the group continued to commit against civilians, his Government would need to remain mobilized and vigilant to stop the LRA from doing more harm. Congolese women in North and South Kivu experienced violence at the hands militias supported by illegal exploitation of resources due to a lack of security in the area. He noted that his Government had decided upon measures to correct the situation, and had begun to address causes of recurrent conflict. Moreover, it was working to enhance its judiciary system to address peace, justice and security issues, making the fight against impunity a key priority. He underscored his country’s efforts to achieve the Millennium Goals and meet its people’s basic needs. The complex nature of the different tasks related to the Goals meant that the Democratic Republic of the Congo was “a project in the making”, requiring multiple contributions. His country had cooperated with partners to improve political and administrative management, and planned to hold presidential and legislative elections in 2011. Turning to United Nations reform, he called for Member States to work firmly together on reform of the Secretariat and the Security Council. The Council needed to be expanded, he said, stressing that the Assembly’s authority must be affirmed in order to enable the Assembly President to find effective solutions to the challenges of our time.